She lives in Colorado with her husband and three children. 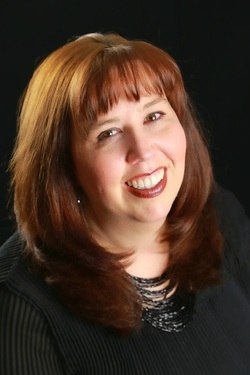 After earning her bachelor’s degree in theatrical stage management from Arizona State University, she went on to work for Disneyland in that capacity. Currently a content producer for an international daily radio program, she’s become a pro at balancing work, writing, and mom duties. And she's a real duchess! Previous appearances include Pikes Peak Library District's Mountain of Authors, GalaxyFest, COSine, and Denver Comic Con. 1. I am a sci-fi geek. 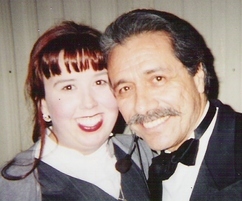 I love Star Wars, Star Trek, Firefly, and Battlestar Galactica (I got to meet Edward James Olmos before he was Adama!). My favorite authors include Kathy Tyers, Lois McMaster Bujold, and Juliet Marillier. I enjoy some fantasy, but I can't stand dragons, zombies, vampires, or werewolves. I'm a little over them. 2. I like to crochet, but I can't read a pattern to save my life. I design my own creations. I make fun, funky hats and sweaters for my kids. 3. I love big band and Broadway. I can sing you just about any showtune...on key, even! Oh, yeah - I am a singer. I also love Styx, Barry Manilow, and the BeeGees. I rock out to disco. I am a child of the 70s. 4. 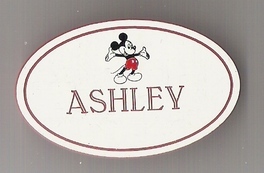 I was a stage manager for Disneyland's Entertainment Department. I got to do all kinds of awesome things while working there - from wagging Pete's Dragon's tail in the Main Street Electrical Parade to working events with the likes of Robin Williams, Carrie Fisher, and Bernadette Peters. Oh, and Mickey Mouse, of course! 5. I was a producer for Focus on the Family's daily radio broadcast. Not only did I get to craft scripts for Dr. James Dobson and John Fuller, but I got to meet many great Christian authors and speakers. After 8 years of being a stay-at-home mom, I returned to Focus as a producer. I also produce podcasts and short radio features, heard by millions of people around the world. 6. I met my husband on the Internet. We didn't meet face-to-face for two years, but established a solid friendship first. We clicked, married in March of 2005, and had our son in December of the same year. Two girls followed - all two years apart. So, I am a busy mama! 7. It makes me happy to be silly and to make other people laugh. Even at my own expense. 8. If the year started in September and ended in December, I would be thrilled. I enjoy fall - my birthday, Halloween, Thanksgiving - and I live for Christmas! Along those same lines, morning shouldn't start before about 10am. I am a night person. 9. Although he comes across as a pretty bad dude, King Henry the VIII is one of my all time favorite historical characters. I like Elizabeth, too. The Tudors rock. 10. I am a real duchess. I have a certificate to prove it!